The Supreme Court’s next attack on civil rights: The justices will likely end the Fair Housing Act’s disparate impact rule. The Roberts court has been hostile toward voting rights and affirmative action. Its next target is the Fair Housing Act. 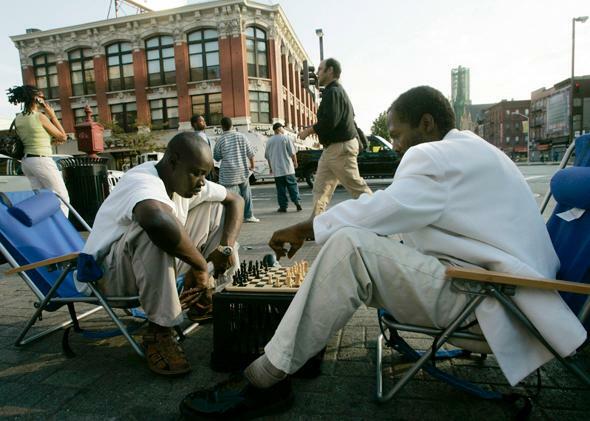 Men play chess on the corner of Lennox Avenue and 125th Street in the Harlem neighborhood of New York on Aug. 9, 2006. Fair housing for minorities is in conservatives’ crosshairs. Last Thursday the Supreme Court agreed to hear arguments in the case of Texas Department of Housing and Community Affairs v. The Inclusive Communities Project. The case concerns the “disparate impact” rule, a legal guideline embedded in the 1968 Fair Housing Act that says discrimination doesn’t have to be intentional to be discrimination. This rule has been at the bedrock of fair-housing enforcement for more than four decades. Another way to understand disparate impact is this: It’s a way to confront the realities of racial inequality without trying to prove the motivations of an institution, organization, or landlord. In housing especially, it’s rare to get someone as explicit about his discrimination as Donald Sterling. More often, you must look for patterns of unequal results or unfair treatment that stem from “objective” or “neutral” criteria. In United States v. Wells Fargo, for example, the Department of Justice sued the mortgage lender over its role in the subprime market. According to the suit, Wells Fargo brokers raised interest rates and fees for more than 30,000 minority customers, and encouraged black and Hispanic homeowners to take subprime loans even if they qualified for traditional financing. We don’t know if malice drove this policy, but under disparate impact guidelines, it doesn’t matter: The government can show concrete harm and act accordingly. This is an expansive power, but given our history, also a necessary one. We built our housing markets on a structure of discrimination, from bias in lending and state-sanctioned segregation to exclusionary zoning and active attacks on minority homeownership. To fix this, you can’t just ban discrimination, you need a countervailing force; otherwise, inequality would reproduce itself. Beyond this, there’s the simple fact that racial bias is still alive in vast areas of American life, and it’s a fool’s errand to root out racists—most people who discriminate are too smart to broadcast their prejudice. Disparate impact—backed by both courts and the present administration—is a vital tool in fighting these battles. Scalia and the conservative bloc of the Supreme Court are hostile to almost all race-conscious policies—from affirmative action (which Justice Clarence Thomas once compared to segregation) to important parts of the Voting Rights Act—and want to end disparate impact as a federal tool. Last year they almost had a chance; a group of New Jersey residents challenged disparate impact in Mount Holly v. Mount Holly Gardens Citizens in Action, Inc., a fight over a neighborhood revitalization plan that plaintiffs claimed would dislocate and disproportionately harm minority residents. But the case was settled before it could reach the high court. With the latest case, a settlement is unlikely. The court will hear disparate impact, and most likely—following Chief Justice John Roberts’ infamous declaration that “the way to stop discrimination on the basis of race is to stop discriminating on the basis of race”—end it. It’s hard to overstate the magnitude of such a decision. In the last decade, with Roberts at the forefront, the Supreme Court has chipped away at the major provisions and policies of the civil rights era. With Parents Involved in Community Schools v. Seattle School District No. 1 in 2007, the Roberts court struck down voluntary integration efforts in Seattle; with Shelby County v. Holder, it struck down the preclearance formula for the Voting Rights Act, gutting the law and opening the door to voter suppression; and with Schuette v. BAMN, it gave Michigan voters free rein to block affirmative action through constitutional amendment. At the moment, it’s poised to uphold strict voter identification laws and—if the opportunity presents itself—strike at the core provisions of the VRA. There’s a reason Justice Sonia Sotomayor swiped at Roberts in her now-famous Schuette dissent—the chief justice has launched an astounding assault on civil rights law that promises huge consequences for efforts against racial inequality. And indeed, Roberts is joined by a whole host of right-wing legislators and conservative intellectuals—perched at think tanks like the Heritage Foundation and the misnamed Center for Equal Opportunity—all united in a “colorblind” vision of American life that doesn’t see a public role for fighting racial inequality, and often holds it as overstated or attributable to “culture,” not the accumulated effects of past discrimination. What’s interesting is the degree to which this isn’t new. In fact, it sits parallel to our past, where large gains for minorities—and blacks in particular—sit flush with setbacks and challenges. We don’t think of it this way in the popular imagination, but the United States had two periods of “Reconstruction.” The first came after emancipation, when freed slaves worked in alliance with sympathetic whites to rebuild the South and forge a new path after the Civil War. But weakened by President Andrew Johnson, it never came to fruition. Instead, it was destroyed by ex-Confederates who terrorized the South with violence and drove blacks out of political life. With the Democratic Party as their vehicle, these “Redeemers” would set the stage for Jim Crow, convict leasing, and the march of horrors that marked black life for the next century. Where the first Reconstruction had politicians, the second had preachers (and later, again, politicians). And where the first gave us a new Constitution—through the 13th, 14th, and 15th amendments—the second gave force to their provisions, through the Civil Rights Act of 1964, the Voting Rights Act of 1965, and the Fair Housing Act of 1968. It’s these laws—and the court cases that followed—that dismantled Jim Crow and integrated blacks into American political life. Outside the far, far fringes of American life, there’s no challenge to that inclusion. But as we see with large parts of the Republican Party—including today’s conservatives on the Supreme Court—there is a challenge to the race-conscious policies and measures we use to protect and secure the political participation of blacks and other minorities. This attack has far more to do with partisan advantage than any racial animus—as Texas Attorney General Greg Abbott explained in his defense of the state’s voter ID law, the goal is to limit Democrats, not minorities. Still, the effect is the same: applying new state limits on participation that have their largest impact on minorities, with shrinking protection from the federal government. Replace “slavery” with “Jim Crow” and you have the popular conservative view of race and Constitution. And small setbacks aside, that view is on the march, with its crosshairs aimed at disparate impact and the Fair Housing Act. Put another way, if the civil rights movement was Second Reconstruction, then—if we need a name for today’s push against its key measures—you could do worse than the Second Redemption.